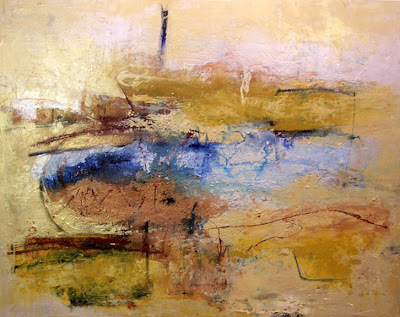 From Nevin Kelly's blog...Local painter, Mary Chiaramonte, will unveil a new series of paintings called “Murmur” at the Nevin Kelly Gallery... Mary participated in the gallery’s “Women’s Work” exhibition earlier this year. Friday, August 3, 2007 at 6:30 p.m. Hailed by The New York Times as “both a virtuoso with Herculean technical command and a sensitive introspective artist,” Jamaican pianist Paul Shaw has appeared on three continents, inspiring appreciative audiences and music critics alike in Asia, Europe and the Americas. A top prize-winner in the 1988 William Kapell International Piano Competition and the 1986 Young Concert Artists International Auditions, Dr. Shaw has performed to high critical acclaim at prestigious venues including the Lincoln Center in New York, the Kennedy Center, and Beethovenhalle in Bonn, Germany. He has appeared as a soloist with the Brooklyn Philharmonic, the Cape Cod Symphony, the Dayton Philharmonic, the Richmond Symphony, the Rochester Philharmonic, and the Shreveport Symphony. He has collaborated with conductors William Eddins, Lukas Foss, George Manahan, Jorge Mester, Royston Nash, Stanislaw Skrowaczewski, and others. Dr. Shaw was educated at the Juilliard School of Music, where he received three degrees: Bachelor of Music, Master of Music, and Doctor of Musical Arts. Free and open to the public. Photo ID required. Auditorium passes distributed to IDB staff and public at 6:00 p.m. First-come, first-seated. Located at 9 Hillyer Court NW in the vibrant Dupont Circle area of Washington, DC. Eve features Mia Rollow’s latest ventures in video and sound. The artist’s large-scale video projections explore microscopic facets of natural phenomena, which transform under her lens into ambiguous morphing landscapes. Sensually rich environments composed of movement, sound, and light emerge onscreen and confound the viewer with their mystery. These are living, unstable terrains whose unexpected shifting of elemental states creates an effect of both violence and elegance. Rollow’s videoscapes absorb the viewer to the point where all frames of reference are lost. The unfamiliar forms transcend our understanding, and we are confronted by the realm of the unknown. IA&A’s Hillyer Art Space is funded in part by the DC Commission on the Arts and Humanities, an agency supported in part by the National Endowment for the Arts. This performance will take place at Bodysmith parking lot..
Healing is a performance-installation which represents a breaking point with life caused by sudden, violent death. Symbolic, ritual actions expressing the pain and chaos this wrenching of life creates will be performed along with those expressing transcendence and healing of the departed soul and the loved ones who remain. This performance commemorates the first anniversary of the death of the artist's little brother, who was kidnapped and murdered in Colombia by the FARC terrorist guerrillas. Colombian born, Kata Mejia is no lightweight performance artist. Her work is raw emotion played without pretense. She attacks her concerns with everything she has: her body, mind and soul. That attack is dramatic, sometimes violent and speaks to the human condition. Good Food Fuels Good Art and helps create the character of our neighborhood. The ongoing street and sidewalk construction on P Street will certainly improve the look and feel of our neighborhood, but it is hurting many of our most cherished local businesses. The July 25th edition of The Dupont Current reports that some restaurants have suffered a 60% decline in Saturday night business due to street construction, and they may not survive unless things turn around- soon. It seems the out-of-towners and those who used to drive to P Street are coming less frequently. Of course we locals continue to dine on P Street but, if we want our favorite restaurants to be there next year, we will need to make a conscious effort to choose to more often dine on P Street when we dine out. Dupont’s P Street Restaurant Row is a local and regional treasure. Long time favorites like Pesce, Tiramisu, Obelisk, and Pizza Paradiso regularly win Washingtonian and Washington Post awards. The more recently opened dining spot, Mark and Orlando's, received a rating of “Excellent” from the Zagat Guide, and was a Washingtonian 100 Best Bargain Restaurant. Even more recent newcomers Monsouris and Marraskesh Palace have opened to rave reviews. There's sushi at Sakana, Cafe Japone, and Sushi Uno, and moderately priced pizza, Middle Eastern cuisine, Indian food, andburgers. Outdoor cafes. And there are amazing fresh and custom made donuts at The Fractured Prune. P Street has all this and more in just two blocks. More than a dozen of us - without any ties to these businesses - met last week to put together a plan of action to help the P Street shops and restaurants weather the final six months of the streetscape project. This e-mail is the first part of that plan. Feel free to forward it to others. destinations may be gone by then. We're reaching out to civic organizations and businesses, urging them to support P Street Restaurant Row. We're going to partner with the P Street businesses to stage promotions. You'll see us around. We're doing this because we think our small, independent establishments are a large part of what makes Dupont Circle special. So, please, patronize these wonderful independent restaurants and stores now. Going out for lunch or dinner is a great thing, especially when you're helping keep Dupont the great dining destination it is. And since our local P Street restaurants are all small businesses, our extra help this summer and fall will make a real difference. Together, we can do it. All you have to do is step up to the plate ...and eat!" I'm catching a few emails as I travel and will post some relevant news from DC as I can from out here in the big wide world. "Ellwood Thompson's has been overwhelmed with support from Columbia Heights residents as well as others in DC's other outstanding communities. Thank you all very much! An update in our search is that we are currently very interested in the DC USA development nearing completion on 14th Ave. We encourage any support that the neighborhood's interested residents can provide??" "We would like to explain our store concept a little clearer since there have been a lot of comparisons to other Natural Markets in the area. Ellwood Thompson's is a full-service Natural/Organic Market that does not sell any products that contain artificial flavors, colors or preservatives. Our products contain no hydrogenated oils, parabens, high fructose corn syrup or transfats." "The store is approximately 15,000 SF and we're stewards of local farming and merchants (often working directly with the farm). Quality is top priority and sampling is encouraged. We have a full-service meat case (free-range varieties) as well as a deli case/hot bar and a health and beauty section. I hope this information is helpful in providing a snapshot of what Ellwood's has to offer Columbia Heights." On the way to the west coast, more later.....keep the creative fires going. 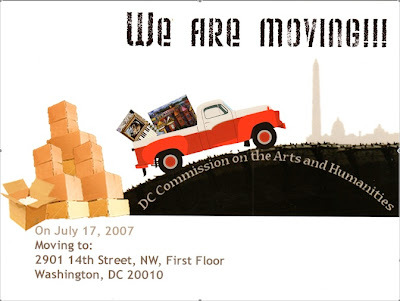 NVAB's Kevin Mellema reviews '2007 Wall Mountables' taking place through September 7, at DCAC, 2438 18th St. NW, Washington, D.C. Gallery Hours are Wednesday through Sunday, 2 p.m. to 7 p.m. 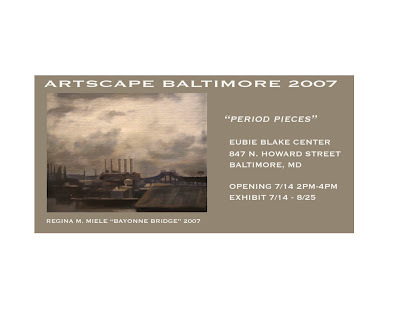 Call (202) 462-7833, or visit www.dcartscenter.org. NOTE: DCAC will be CLOSED August 15 – 26. "A Tribute to Latin Jazz & Salsa"
Project 4 presents “Useless”, a group exhibition of works by architects, industrial designers and artists exploring the flip side of functionality. Whether by choice or by error, the creation of a useless object in a culture so focused on efficiency and convenience, is a compelling action. As art and design increasingly borrow each other’s priorities of aesthetics and value, the dissolution of use all together becomes an entertaining process to investigate within design. “Useless” will feature products, prototypes and objects that are either made to deny function, have been deemed, due to error, un-useable, or represented as such. The conditions surrounding the creation of these works therefore range from commercial design to subversive artistic acts. Amid these different motivations, all of the works present a contrariness to our everyday experience with material culture that is both humorous and insightful. Our elegant weather system produced this spectacle this week. This painting leaves for California tomorrow, a day before I do. We're heading to the land of grapes north of San Francisco. I've painted it in more muted tones which feels right for these times. There's a first Friday gallery walk in Healdsburg and I'm betting the painting arrives in time to grace the walls at the Arches Gallery. Irvine Contemporary presents Introductions3, a selection of recent graduates from leading national and international art schools. This third year of Introductions at Irvine Contemporary is the first gallery exhibition of its kind. Over 250 artists from 60 different art colleges were reviewed for Introductions3, and final selections were made with the advice of a panel of art collectors, rather than curators or gallerists. Introductions3 has grown to an inclusive “MFA annual” that brings the best rising artists to Washington, D.C. Participating artists are listed below with their most recent college or institute affiliation. Maura Q Brewer (School of the Art Institute of Chicago, Sculpture and Drawings) presents a series of sculptures and drawings that reconcieve the materials of work and authority. In her works, tuxedo shirts or men’s business shirts are appropriated for the way they encode one type of social status or authority, but folding and ironing these materials transform the symbols of men’s culture into a new kind of architecture through traditionally “invisible” women’s work. Amy Chan (Rhode Island School of Design, Paintings) presents a series of paintings that portray "new ecosystems" created in America by the close crowding of human development and nature . Using patterned motifs and visual fragments from highway scenes, her work re-envisions the landscape coming to terms with suburban sprawl. Amy Chan also has a Fellowship with the Virginia Museum of Fine Arts this year. Lauren Clay ( Virginia Commonwealth University, Sculpture and Installation) presents sculptures and drawings that move inherited minimalist forms into organic space where they seem to give birth to new self-generating forms. Her sculptures are carefully constructed from cut paper and painted with acrylic, and provide a feminine expansion on minimalist geometry and solidity of objects. Her objects combine ideas from architecture and organic form in innovative ways. Katie Lewis ( California College of the Arts, San Francisco, Sculpture and Installation) presents three-dimensional works with pins, thread, enamel, and mylar that provide visual maps of sensations, nervous systems, and information networks envisioned as swarms and dense information nodes. Starting as maps for recording sensations and information, her works present new visualizations of the invisible flows of sensation and information we experience every day. Akemi Maegawa (Cranbrook Institute, Sculptures and Installation) presents both ceramic sculptures and an installation project, both of which transform common objects with new contexts and content. Her “Artist’s Studio,” with each object wrapped in white felt, creates new volumes of space for objects ordinarily unnoticed. The artist studied for her BFA at Corcoran College, and after completing her MFA at Cranbrook, has returned to Washington, D.C. where she now lives and works. Rocky McCorkle (San Francisco Art Institute, Photographs), presents a series of hyperreal photographs shot with large format negatives that play with the language of film stills and glossy magazine ads. The highly composed images present a narrative about the central characters’ real and imagined lives that mix fact and fantasy, branding and symbolism in a thoroughly captivating fictional world. Sarah Mizer ( Virginia Commonwealth University, Sculpture and Installation) composes elegant text-based works in glass, using light and shadow to re-envision words, lines, and columns of text. With our common metaphors of writing, texts, and illumination resonating in the background, the artist’s compositions open up a reflective and meditative space around writing and words as sculptural and three-dimensional forms. Ryan Pierce ( California College of the Arts, San Francisco, Paintings) presents a series of paintings that depict an imagined “ecoregion,” landscapes viewed not by political or national boundaries but by a spectrum of human impact on an environment. The scenes are images of possible post-industrial worlds that may lean at times, or even simultaneously, toward utopian or dystopian states. Erin Colleen Williams ( Virginia Commonwealth University, Sculpture and Installation) creates hybrid objects that draw from imaginary machines and technology both past and present. The artist explores questions of biology, mortality, memory, desire, and the body, and presents works that seem to be impossible machines from the past that also reflect today’s obsessions. As if recovered by a Victorian time machine, the sculptures are both the lost and latest devices for augmenting human organs and enhancing pleasure and perception. Stephanie Williams & Jesse Thompson (Rhode Island School of Design, Video) present a collaborative video project based on a child’s private mythology and imaginary world created from reading the Bible and a fragment of overheard parents’ conversation. Using sets and animation, the artists create a convincing alternate reality seen from a child’s point of view. 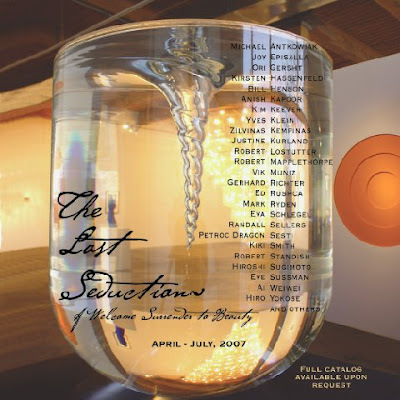 Irvine Contemporary gives special thanks to the collectors' selection panel. The final selection of exhibiting artists was made with the advice and suggestions of Tim Cone, Joseph DiGangi, Philippa Hughes, Henry Thaggert, and Melissa Schonder. Irvine Contemporary is grateful for their time and commitment in helping to bring the best of rising artist talent to Irvine Contemporary for Introductions3. The Ronald Reagan Building and International Trade Center is located on historic Pennsylvania Avenue in the heart of Washington, DC. Washington City Paper blogs it all. "Murphy's Drunkard is a triumph. Humour abounds... Brilliant." -The Examiner (Ireland) Comedy, tragedy, heroics, villainy and song in this exuberant, life-affirming medlodrama. THE ONLY SHOW RUNNING ALL 10 DAYS OF THE CAPITAL FRINGE FESTIVAL! This is a little off the arts beat path. Since I'm a BIg lover of natural foods and feel that a natural market is a plus in our neighborhoods, I'm putting this information out. Plus, good food fuels good art, doesn't it. At least it gets you in a good spot to create the work. Ellwood Thompson's Local Market operates a full service grocery store in Richmond, VA. They are recently focusing on the Columbia Heights area because they like the diversity and density of the area and believe that people in this area of DC would appreciate the unique experience of their concept. Ellwood Thompson's is committed to supporting local farmers, manufactures and other local merchants. ET would gladly sponsor local farmers markets. Additionally they have a strong commitment to the environment and ideally would like to be in a "Leeds" certified or "Green" concept building. They welcome any comments from you, my readers. On July 14, Councilmember Graham unveiled the inspirational quote by Walt Whitman inscribed outside the entrance of the Dupont Circle Metro station in Washington, DC. 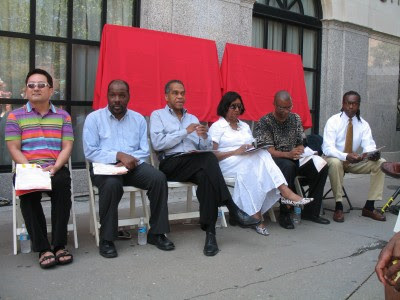 The artwork is a tribute to the response by volunteers and caregivers to the needs of people living with HIV/Aids in DC. Councilmember Jim Graham (D-Ward One) in Washington, DC kicked off the anti-graffiti mural program Wednesday, July 18 at 11am in front of the Cluck-U Chicken restaurant at 2921 Georgia Ave, NW. The program will identify locations repeatedly tagged by illegal graffiti and replace the graffiti with a community inspired mural. “This creative approach,” said Councilmember Graham, “will help stop graffiti and give youth a positive outlet for their creativity.” The program is based on Philadelphia’s Mural Arts Program, which has reduced graffiti by placing murals in strategic locations. Councilmember Graham secured $100,000 in the city’s budget to support 50 murals. Up to three murals will be created in Ward One this summer as part of the pilot program. The remainder of the murals will be created throughout the city, starting this fall. The Department of Public Works will work with the Metropolitan Police Department, business owners and community organizations to identify potential locations. The non-profit organization, Midnight Forum, will then work with young people from the PROUrban Youth summer employment program to design and paint the murals. Councilmember Graham has also secured an additional $250,000 for graffiti resistant paint and has secured funding for 27 new jobs to be filled by qualified ex-offenders for anti-graffiti and alley cutback programs. In its final week, Ken Ashton's Megalopolis and Lily Cox-Richard's At Stake and Rider closes on Saturday, July 21, 2007. Join Civilian for a talk with the artists to round out an amazing show. Open to the public, the discussion begins at 3:00 p.m. and will be moderated by Civilian Art Projects' Director, Jayme McLellan. Refreshments will be served. All photographic works are welcome, conventional and unconventional processes, techniques, aesthetics, approaches, subjects, material or digital works, video, photo installations. The judge for the show is Bruce McKaig, artist, instructor, and Chair of the Capitol Hill Arts Workshop's Photography Department. There is a $25 entry fee per artist to CHAW for up to three images and $5 per additional image up to five total. Prizes will be awarded in various categories. For more information, visit www.chaw.org or call (202) 547-6839. Eastern Market will be rocking this Sunday on July 22. Blues musicians Rick Franklin, Mike Baytop and The Resonators will kick off the Eastern Market Music series on Sunday. The series is sponsored by the Capitol Hill Community Foundation. A variety of the area’s best blues, bluegrass, jazz, contemporary, and international musicians will play at the market each Sunday through the end of September. Rick Franklin and Mike Baytop begin the festivities at 10:30 a.m. on Sunday with The Resonators following at 1 p.m. The musicians will be set up outside of Port City Java, 701 North Carolina Ave., SE. Washington, DC. Thursday, July 26, 2007 6:30 p.m. The Feterman Duo comprises the Costa Rican pianists and sisters Sara and Gertrudis Feterman, who received their degrees in Piano from the University of Costa Rica and their Masters degrees in Piano Performance from Carnegie-Mellon University in Pittsburgh, Pennsylvania, where they studied under Alan Feinberg and Irene Shreier. The Feterman Duo have performed in many Latin American countries and in the United States. In 2002 the sisters recorded their first CD, entitled Juegos Musicales para Piano a Cuatro Manos (Piano Music for Four Hands). Currently, both pianists are Associate Professors of Music at the University of Costa Rica. First-come, first-seated. For ages 13 and up. Attire is business casual. This mural explores celebration, violence, private and public sexual events, and the link between comedy and anxiety. Inspired by Taoist painting styles, the brushstrokes are long and loose. Done freehand, the subject matter emerges organically, fabric twisting and turning, bodies both gruesome and elegant. Surrealistically, organs undergo extreme fantasy segmentation, dividing into a series of semi-repetitive segments, multiplying into a vision of absurdity. There is an outragesness that implies both humor and horror. Like watching a B horror film, which can be over the top, simultaneously funny and scary. The palette, black Sumi ink and cadmium red, implies an overall feeling of doom while also hinting at the summer dresses and polka dots Chriss sites as part of his inspiration. This drawing will be up for the rest of the summer, along with a varying group of works from gallery artists, currently a selection of Chan Chao’s photographs. The application for the 2008 Palm Beach Fine Craft Show is now available online. Crafts America shows are open to all craft artists who reside and work in the United States. All work must be well conceived and expertly executed in the U.S. It also must be made by hand or with the use of appropriate tools. Whether one-of-a-kind or limited production, work should reflect the individuality of the artist. sponsored by the GCH Endowment to Promote Quality Early Childhood Education. Bright Horizons Foundation for Children, DC Children and Youth Investment Trust Corporation, DC Commission on the Arts and Humanities with the DC Early Care and Education Administration, DC Leadership in Action Fund of The Community Foundation for the National Capital Region, E*TRADE Financial Corporation Donor Advised Fund of The Community Foundation for the National Capital Region, Fannie Mae Foundation Fund of The Community Foundation for the National Capital Region, Federal City Council, International Union of Bricklayers and Allied Craftworkers, M. Russell and Associates, PNC Bank, Procter & Gamble, Teaching Strategies, Inc., and W.K. Kellogg Foundation. Looking for some wild life in the city? Check out zenfisbee's photostream for shots of tigers lounging in the water. a 163-acre zoological park set amid Rock Creek Park in the heart of Washington, D.C. Open to the public 364 days a year, home to 2,000 individual animals of nearly 400 different species. “Katrina Diaries” from New Orleans artists. Baltimore artist, Tony Shore was awarded the $25,000 Sondheim prize. "A Baltimore artist whose portraits of family and friends painted on black velvet capture the poignant and gritty flavor of working class life in the city, was named Friday the winner of this year's Janet and Walter Sondheim Artscape Prize." Highly animated Kojo Nmandi show with Lenny Campello, Jeffry Cudlin and Dr. Claudia Rousseau here. KNEW GALLERY'S GROUP SHOW OF MORE THAN 20 ARTISTS FROM THE EAST COAST TO LOS ANGELES IN "A GOOD TIME IS RIGHT NOW". Over 20 artists - more established to very emerging - fill the two floors of space in the gallery with photography, painting, and sculpture. Opening reception is July 19th 6-10 pm. KNEW GALLERY'S exhibit - A GOOD TIME IS NOW - features Philadelphia and New York artists Michael Ciervo, Paul Campbell, Cecilia Biagini, Cibele Vieria, and others in its Summer of Art exhibit that includes works by Gallery artists Fernando Canovas, John Fasano, Peter Fox, and Raimundo Rubio. Using every inch of the two floors and courtyard space at KNEW GALLERY'S location plus the exhibit space at the District Fine Arts (DFA) space two blocks north of KNEW GALLERY at 1726 Wisconsin Avenue, visitors to both exhibits will be treated to a smorgasbord of color and process crossing various artistic media - from photographs and paintings to somewhere beyond. The staging of the openings in tandem refers back to both Galleries' July 2006 exhibits in which each gallery's audience was encouraged to visit the other gallery - conveying positive energy reminiscent of the feel good times of the best of the hippie days. The complete list of artists featured at KNEW GALLERY in A GOOD TIME IS NOW includes artists Aimee Anthony, Selina Lamberti, Chris Gibson, Jeffers Egan, Paul Gallegos, Stephen Gratz, Jonas Griscoe, Ryan Carr Johnson, Cat Manolis, MegaSleepyhead, Kevin Mellena, Katie Middleton, Maria Elena Naveillan, Francis Schanz, Alexander Voslonsky, and Lien Yao. Richard Friedman - photographer. I was 21 with a brand new Nikkormat camera and living in Greenwich Village in 1965. Much happened, for better and worse, by the time I left for Berkeley three years later. These images are what I remember. I've been taking pictures ever since. Gene Markowski - painter/photographer. In the late 1960's I made my first trip to the Western states of Colorado, Utah, Wyoming, Montana, and the Dakotas, spending three summer months driving to places of interest for me, it was love at first sight. The landscape, people, and Western culture in general was something new, and had a huge affect upon my work as an artist. However, the Western trip also marks a stylistic shift from reprentation to abstraction, and even although my paintings began the journey of abstraction, the love of Western culture remained in spirit for many years. Robert Otter - photographer. Robert (Bob) made his living as a commercial photographer, but his soul yearned for something more. He was a native New Yorker as well as a Greenwich Village resident, and preserved the Village through his masterful imagery: a vibrant, bohemian community perceived by many as the "eye of the hurricane" that was the Sixties. A haven for an unusual assortment of artists, families, counter-culture types, philosophers, working folks, and various oddballs, Otter's lens caught it all. In the early 1970s, after ten years as a professional photographer, he exited the artistic world, and passed away in 1986. Steven Rosenberg- painter. I was born in 1950 and as a kid I did not know what interesting times we lived in. It Seemed like a time of innocence but cold war suspicions led to events and policies that would steer many lives down confrontational paths. I came to bear witness to many life altering events and I remain deeply effected by the power of these moments especially some that occurred during the sixties and seventies. I was an avid concert goer and I do believe that as a youngster when I went to a Janis Joplin, Jimmy Hendrix and The Chambers Brothers concert, I started the evening as a preppy Kid and left a hair down Hippy. New Port jazz Fest then on to Woodstock that same summer of 69. Events in Vietnam were certainly hot topics and the events pointed towards a downward spiral. I started college in the fall of 1969 at Kent State University. My conscience led me to become an active participant in the "anti-war movement". I traveled to Washington as did many of my family and friends. I participated in rallies and discussions in an effort to end the war. The bombing of Cambodia led to the surreal encounter between Kent State Students and the National Guard. The pieces enclosed capture some of the loss of innocence and anger at the polarizing forces that co-opted our values. I also hope they capture some of the temper of the times. Karl Umlauf- painter/sculptor. Throughout the 60's I was intensely involved in the landscape from a very frontal/vertical viewpoint. The work having a geological inspiration presented a semi-abstract view of cliff formations; synclines, faults, eroded washouts, hillsides, etc. Then in 1969 I found I could no longer avoid moving toward a more 3 dimensional relief format. The image became completely abstract and the material was very experimental. Fiberglass and aluminum overlays still carried the rhythms and energy of the geological formations. It was a challenge to move forward into an unknown world of ideas, concepts and methodologies to achieve new goals. The risk was worth it! Annual survey of BFA/MFA graduates in the Washington/Baltimore area. Paintings by Elyse Harrison + Sculptures by Mark "Wireman" Coburn. An exhibit featuring current artists influenced by the Color School. Irvine Contemporary artist Ju-Yeon Kim is in The Savannah College of Art and Design-Lacoste exhibition "Afterglow." This exhibition is an exploration of light as an aesthetic, material, conceptual and poetic phenomenon by artists Ghada Amer, Patrick Blanc, Maja Godlewska, Hervé Half, Alfredo Jaar, Ju-Yeon Kim and Bill Viola. July 6-August 28. Those volunteers and caregivers who have responded to the calls of the HIV/AIDS crisis will soon be getting a permanent tribute. 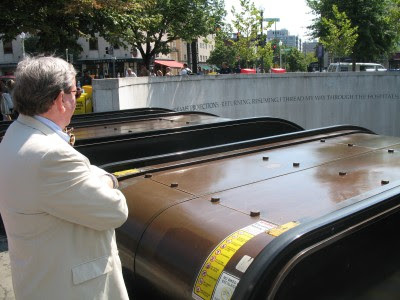 On July 14, the Washington Metropolitan Area Transit Authority, the DC Commission on the Arts & Humanities and City Councilmember Jim Graham (D-Ward 1) will dedicate the tribute, which consists of two engravings. In the circular, granite entrance above the north entrance to the Dupont Circle Metrorail Station, will be engraved an excerpt from ''The Dresser,'' a poem by Walt Whitman, the famed gay poet who lived from 1819-92. Whitman's name is incorporated into Whitman-Walker Clinic, the D.C. clinic founded in 1973 initially as the Gay Men's VD Clinic. Graham, who initiated this project, has a long history with the clinic, having served as clinic president, executive director, and on its board of directors. The second portion of the tribute will be a contemporary poem, ''We Embrace,'' written by Howard University Professor E. Ethelbert Miller. Miller's poem will be inscribed on the sidewalk above the station. The July 14 dedication ceremony will begin at 11 a.m. at the station entrance at Connecticut Avenue and Q Street NW. 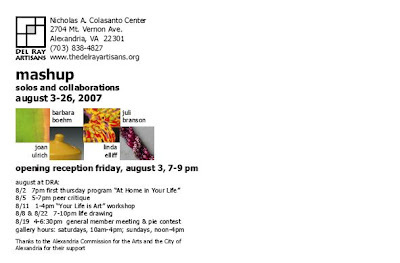 Transformer’s 2006/2007 exhibition series is supported by The Andy Warhol Foundation for the Visual Arts, The DC Commission on the Arts and Humanities/NEA, the Morris & Gwendolyn Cafritz Foundation, The Eugene and Agnes E. Meyer Foundation, and The Visionary Friends of Transformer. They came. They saw. They took it all. Monday, July 16, 2007 at 6:30 p.m.
Free and open to the public, first-come, first-seated, photo ID required. In this action-filled adventure, two former thieves reunite to rob the biggest thief they know -- Moctesuma Valdez, a TV infomercial guru who has made millions selling worthless health products to poor Latino immigrants. When none of their affiliates want to go undercover as day laborers to pull off the heist, the two men turn to the real thing for help. Starring Fernando Colunga, Miguel Varoni (who will attend the screening), Gabriel Soto, Julie Gonzalo, Ivonne Montero, Sonya Smith, and Saúl Lisazo. Directed by Joe Menendez. urbancode, a new online magazine about the DC Arts Scene! "In the current issue #2 of urbancode you will read about many who are doing things to enliven the arts community here in the Metro area. Witness Ryan Hill who is bucking the industry trend and has opened Strangeland Records. You might want to visit his establishment and justify his belief in the dynamism and vast potential of the cultural scene we have here. Filmmaker Jon Gann runs three separate local film agencies; DC Film Salon, DC Shorts Festival, and DC Film Alliance, and Patricia Finneran, oversees the SilverDocs festival at the AFI--all are important cogs in the machine! That doesn't even begin to scratch the surface though, because there are lots of musicians plugging away and continually evolving an already exciting and renowned music scene!" *News about the future of the Warehouse Gallery Theatre Complex is included in this current issue of urbancode. urbancode is published 8 times yearly by urbancode design. Subscriptions may be obtained free by sending an email to urbancodemag@gmail.com and requesting Add Me! Molly Ruppert is hoping to gather work from all the artists who have had art in any Romp. Notice will be sent to artists in a week or 2. If you are one of the many - be ready! Art Romp opens September 7th. 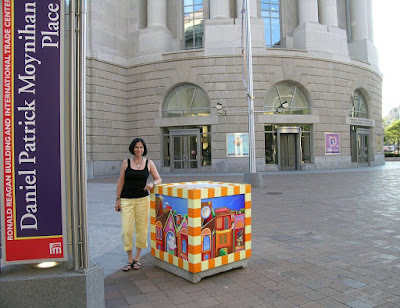 "The festival, hosted by the DC Commission on the Arts and Humanities, runs Monday through next Saturday. All events are free, but arrive early to get seats. A festival kick-off party, featuring DJ Rich Medina, is Monday at 9:30 p.m. at Andalu, 1214 18th St. NW." "Returning for its sixth year, the Hip-Hop Theater Festival arrives this summer with an exhilarating plethora of performance, dance and poetry. The Festival continues to engage Hip-Hop generation artists from in and outside Washington, DC in a dynamic mix of developing and established works. Highlights include: Jerry Quickley’s Live from the Front about a B-boy in Baghdad at the start of the war and J. Kyle Manzay’s The Actor’s Rap!, a comedy about a group of frustrated actors who take matters into their own hands as rappers relentlessly steal their roles in film and theater. Local playwrights and performers include Holly Bass; Bashi Rose; Hueman Prophets, Goldie Patrick and poets from Sol y Soul. And thanks to the DC Commission on the Arts & Humanities, The Hip-Hop Theater Festival is proud to present all events free of charge." For information or a full schedule, visit http://www.hiphoptheaterfest.orgor call 202-724-5613. “Don’t do it buddy. You’re a young man! You’ve got your whole life ahead of you!” Thankfully, photographer Kerry Skarbakka uses a network of unseen wires to suspend himself in mid-air in the photographs that compose “The Struggle to Right Oneself,” an exhibition that “dramatizes one of the deepest themes of our moment—the sense [of] losing balance and control both personally and socially.” “The Struggle to Right Oneself” is accompanied by an exhibition of photographs by Los Angeles-based photographer Marla Rutherford. 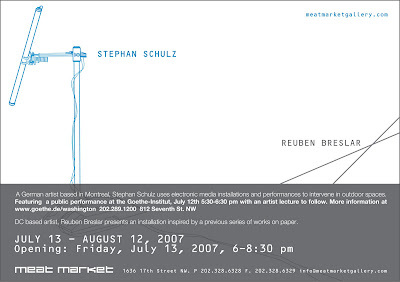 The exhibition is on view through Saturday, August 4, 2007. This exhibition is presented in partnership with the Smithsonian Institution’s Latino Center and the Mexican Cultural Institute. Holland Cotter wrote a piece about America's Museum on the Mall. "Mr. Small was right about the Smithsonian being America’s museum. It is and has been since 1836, when the government accepted a gift from James Smithson, a British scientist who wanted to found “an establishment for the increase and diffusion of knowledge” for a young nation. (Smithson, who never set foot in America, is buried near the Smithsonian Castle.)" ..."That national identity is the real reason to care about what shape the Smithsonian is in." There's a good article in the current edition of Art World News about choosing the right giclée printer. -•- A copy of Alyson B. Stanfield's article about writing and sending more tempting emails in the June issue of Art Business News is online. -•- Society of North American Goldsmiths...Professional Guidelines have been developed as a reference to help everyone involved with the arts and crafts community learn how to handle common but important situations that may arise... basic tools for implementing improved and equitable business, leading toward standard professional practices. The Fraser Gallery exhibit of the finalists closes on July 7. A movement-tracking suit sets a flourescent-light display a-flutter. Bowie, Maryland- On Friday June 29th Overdue Recognition Art Gallery hosted a silent auction for the National Center for Black Philanthropy’s Sixth National Conference at the Crystal Gateway Marriot in Pentagon City, Virginia. The conference celebrated individuals in the community that continuously give back to the African American community. Among its honorees were former president Bill Clinton, activist Dr. Dorothy Height, athlete Shaquille O’Neal, and vocalist and minister Wintley Phipps. Gallery owner Jackie Thompson states, “It was great exposure, and this is just the start for the gallery to give back to the community”. Overdue Recognition is the first and only African American Art Gallery in the Bowie area representing over 75 renowned and emerging African American artists. Specializing in originals, serigraphs, giclees, limited and open edition lithographs, the gallery is also available for receptions and consultations on both corporate and home art needs. As part of Art in Heat there will be a Dr. Sketchy's Anti-Art School this Saturday night at the Warehouse. Hosted by Elvis, the “Red King” and featuring Bambi Galore and Lil' Dutch. The show starts at 7 and drawing continues until 11:30. There will be drawing contests, drink specials, and everyone is invited to stay after Dr. Sketchy for karaoke with Elvis. How is Dr. Sketchy's different from a normal life drawing class? In normal life classes, silent students sit in a silent room and draw a bored, oft-uninteresting model. In Dr. Sketchy's we've got bodacious burlesque queens as models. We've got ridiculous art contests (best incorporation of a woodland animal? Best imagined costume? ), good music and flashy prizes. We've got a selection of posh beverages- alcoholic and not- available to buy. At Dr. Sketchy's, we don't care if you picked up a pad yesterday or 50 years ago. Come to drink or to draw. We're happy to have you. All dry mediums are okay, as are dip pens and a neat watercolour sets. Oil paints, messy mediums and stinky mediums are not okay. Please don't cause a mess. Sharpen your pencils over the garbage can. This large-scale survey exhibition of contemporary work in all media brings together an impressive group of established and emerging artists: Michael Antkowiak, Joy Episalla, Ori Gehrst, Kirsten Hassenfeld, Bill Henson, Anish Kapoor, Kim Keever, Zilvinias Kempinas, Yves Klein, Justine Kurland, Robert Lostutter, Robert Mapplethorpe, Vik Muniz, Gerhard Richter, Ed Ruscha, Mark Ryden, Eva Schlegel, Randall Sellers, Petroc Dragon Sesti, Kiki Smith, Robert Standish, Hiroshi Sugimoto, Eve Sussman, Ai Weiwei, and Hiro Yokose. H&F Fine Arts is pleased to announce a solo exhibition by Washington, DC-based artist A.B. Miner. Featuring work created over the past seven years. Chimera runs from July 5 to August 4. Opening reception, Friday, July 6 from 6:00–9:00pm. Borrowing its name from the combined lion/goat/serpent monster of Greek mythology, Chimera invites close study of the hybrid state, exploring the complexities of gender fluidity and the ambiguities of identity. The sublime and the grotesque commingle in Miner's honest, revealing portraits; the resulting tension infuses his work with an energetic dissonance. Miner is obsessed with twinning—an examination of the artist as a subject divided by the pressures of an externally focused need for binary definitions. He is equally interested in documenting the shades of transformation—from one state, form, or definition, to another. Working in oil impasto, the artist captures the monumental on a tiny scale (the majority of Miner's painting are smaller than one foot square). His diminutive portraits invite intimate examination. The claustrophobia of the compositions is amplified by the resulting compression of space between viewer and canvas, creating an unwelcome proximity that transfers the artist's discomfort to the viewer. Miner's heavily impastoed surfaces are meant to contribute to this visceral revulsion; the work invites close scrutiny only to repel it. Miner received an MFA from Queens College, CUNY in 2000. He has been a recipient of the DC Commission on the Arts and Humanities Young Artist Program Grant and 2005 Artist's Fellowship. Major exhibitions include "Intimate," a solo exhibition at the Nevin Kelly Gallery in 2003 and "Me, You and Those Other Folks" at Flashpoint in 2006. Miner is Assistant to the Chief Curator at the Hirshhorn Museum. 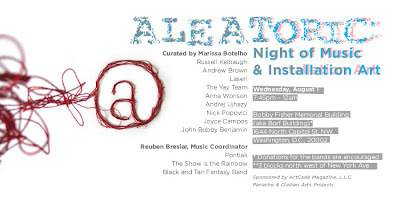 Reception at DC Arts Center, Tuesday, July 3, from 6 to 9 pm. July 3 as Herb White Day. Please join in acknowledging Herb's contribution to Washington, and particularly DCAC, by attending a reception at DCAC from 6 - 8 pm. Drinks and light refreshments will be served as we take a moment to mark this momentous occasion and reflect on the impact of this generous and invigorating individual who touched so many lives. Without Herb White there would not be a DCAC.